Topic: In this post, you will find an example of how to build and deploy a basic artificial neural network scoring engine using PL/SQL for recognizing handwritten digits. This post is intended for learning purposes, in particular for Oracle practitioners who want a hands-on introduction to neural networks. In previous articles I wrote about dealing with a missing cent when you need to divide a certain amount over multiple lines. In these articles, links are at the bottom, I described a method to calculate the difference on the last row. Modularity - we encapsulate logically related components into an easy to understand structure. Easier Application Design - we can start with the interface in the package specification and code the implementation later. So we need to define at least one interface - packages - for each category in order that we can grant the appropriate access to different groups of users: read-only users, regular users, power users. Here are some more principles which can help us design better programs. These principles aren't part of an organized theory, and they're aren't particularly related to any programming paradigm. But each is part of the canon, and each is about the relationship between a program's interface and its implementation. When we talk about program design we're mainly talking about interface design. The interface is the part of our program that the users interact with. Normally discussion of UI focuses on GUI or UX, that is, the interface with the end user of our application. But developers are users too. Recently I got involved in a question on Temporal Validity Periods together with Chris Saxon, one of the askTom-answer team. 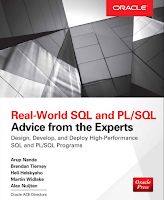 Designing PL/SQL Programs is a succession of articles published the articles in a nonlinear fashion. Eventually it will evolve into a coherent series. In the meantime this page serves as a map and navigation aid. I will add articles to it as and when I publish them. These design principles may seem rather academic, so let's look at a real life demonstration of how applying Dependency Inversion Principle lead to an improved software design.